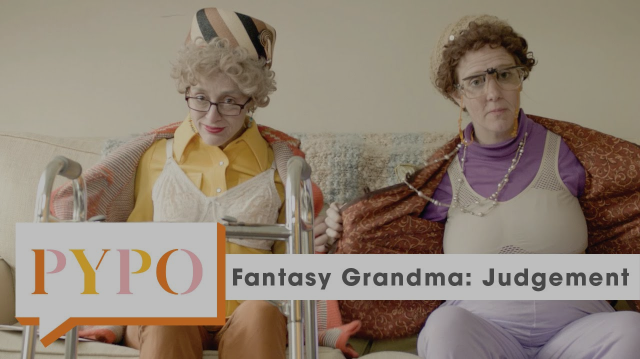 And look at Fantasy Grandma surrounded by grandbabies in the New York Times! It's a good time to be a funny lady. Mark your calendars for an FG appearance at the New York Funny Songs Festival May 19-21 and June gigs coming up. Grandma advice on feeling invisible and listen to your grandmas on the radio! Did you call us yesterday and hang up? We tried calling back. This one is about how people see you. We wore our fanciest unders. You can also listen to us on Dr. Gameshow on WFMU, where we raised lots of money for the radio station and had a lot of fun playing games that weren't Scrabble or Trivial Pursuit. See the moment Jane B helped out with the kiss! Keep an ear out for new music coming your way soon, and mark your calendars for an FG appearance at the New York Funny Songs Festival May 19-21. Holla at your grandmas on the social media! We love hearing what you're up to and down with. We have a new video on PYPO where we talk about what it menas to feel invisible as an older woman, shame, and being a nuisance to others.